Richmond is a stunning part of London, and the perfect location to film a wedding. The views from the hill are simply breathtaking, and it’s great fun seeing all the locals and tourists stop in wonder at the gorgeous bride and groom. With so many fabulous locations around Richmond, we knew that Laura and George’s big day would be one to remember, but it exceeded all our expectations. Starting the day at The Petersham and Richmond Hill Hotel, as well as a quick pre-ceremony pint in The Roebuck pub, we then moved on to St Matthias Church, followed by a reception on the hill and finally we returned to the Richmond Hill Hotel. Laura and George were amazing together, so full of love and energy, and they were surrounded by their wonderful friends and family, who showed no shyness when it came time to boogie :) This was one of our favourite weddings to film and hopefully you can see why in the video below! The title of the film, “Love Monkeys” relates to the story read by Laura’s sister during the ceremony. You can read the whole story here. It is also the perfect fit for the happy couple, who were so natural, loving and hilarious together. We are often asked what kind of weddings are our favourites to film, or what kind of wedding makes for the best wedding video, and the answer is always the same: it’s all about the people! A blissfully happy couple in love, with the support of their closest friends and family is what we crave. And stunning views, brilliant readings and poignant speeches are nice too of course! Words are the driving force of our films, and on this occasion we had so many heartfelt, meaningful words to choose from. If you’re looking for the best wedding photographer for your big day, you might want to start with these guys. 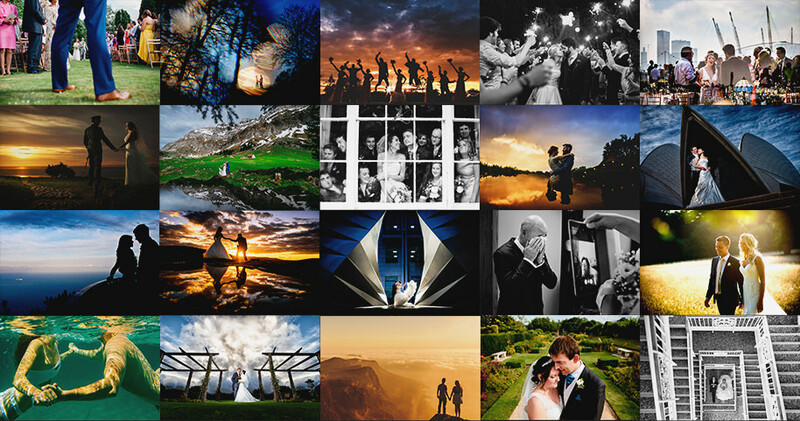 We present 20 leading wedding photographers from around the UK, who are not only producing world class images, but are also great to work with and fun to be around. Beautiful, timeless works of art and a happy, stress-free experience – that’s the goal :) Our list takes into account not only the quality of the photographs but also the personality of the photographers on the day and the experience they provide. We work alongside photographers at every wedding, so we get to see them throughout the day, we see how they react to challenges, get on with the clients and guests, and also how well they work with wedding filmmakers. We really do admire the stunning images that the best wedding photographers produce, often under difficult circumstances, and we are lucky to have so many talented photographers in Britain. Finding the right wedding photographer might seem impossible, but hopefully this top twenty list will help narrow down your selection :) This will be one of the best days of your life, so when choosing the right artists to record the occasion, take your time and listen to your heart. Click here for our top 20 British wedding photographers! A big thank-you to the staff at Wasing Park in Berkshire for their hospitality on this fabulous day. Wasing is a unique venue, offering gorgeous views of the surrounding countryside, and when you’re creating a cinematic wedding video it is a real treat to be in the midst of such breathtaking scenery. The cows grazing in the field right next to the Victorian Summerhouse, where the ceremony was held, added an extra touch of rural ambiance :) Working alongside Paul Rogers, one of the top wedding photographers in the UK, was a real joy. His discreet, friendly approach puts everyone around him at ease, and his reportage style produces authentic and spectacular results. Most of all, we love working with cool clients, and Laura and Rory were the epitome of chilled. They were so relaxed throughout the day and of course deeply in love, surrounded by their amazing families. As you can see below, it was an incredible occasion. The Signature Film is around ten minutes long and has proven to be really popular since we introduced it last year. It’s the perfect length for sharing, while still being long enough to show all the best parts of the day. Laura and Rory’s wedding was packed with hilarious, beautiful and poignant moments, so their film is longer than most, and it was still hard to fit everything in! Musicians for the stunning outdoor ceremony, a band for the reception and another band for the evening party, a lovely (and lively!) Persian ceremony, some of the funniest and most moving speeches, awesome guests and a truly wonderful and gorgeous bride and groom. This all made our job on the day such a pleasure, and has resulted in one of our favourite films to date. We’re back at Fetcham Park! What a treat :) Fetcham Park in Surrey is one of our favourite venues, mixing grand style, impeccable service and gorgeous grounds. The impressive fountain is hard to miss, and really enhances the atmosphere, especially when the sun is shining. A big thank you to all the staff at Fetcham Park for being so hospitable as always, especially the fabulous director, Laura. This wedding was a little unusual for us, as it featured a “Same Day Edit”, so we had to not only record the event but also create a film for the couple to be shown that same evening! It was a challenge, but we pulled it off :) The day started off with Dianna and Felix getting ready at the very smart Brooklands Hotel, where the couple had a view of the race track, and it was great fun seeing the cars whizzing round the circuit. This was such a fab day, and Dianna and Felix were wonderful to work with, full of love and energy, as you can hopefully tell! The Covent Garden String Quartet can be heard at the beginning of the film, and they were superb on the day. It’s not every wedding that we see the groomsmen dressed as Minions! Before the traditional Chinese Tea Ceremony, Felix and the guys were great sports during the games, and suffered the indignities imposed on them by the bridesmaids with determined enthusiasm :) Felix’s brother, Ian, was hilarious and gave perhaps the funniest speech we’ve ever heard – we’ve included a few snippets, but the whole thing had the room in stitches. The title of the film, “Almost Perfect” is a reference to Ian’s opinion of his brother, as you might have realised! The other speeches in general were funny, emotional, beautiful and poignant in equal measure. We love it when the couple do something special for their first dance, and Dianna and Felix really exceeded all expectations with their spectacular and well-rehearsed display! Jaws hit the floor – including ours. At the end of the night, we persuaded the newlyweds to come outside and show us a few moves, so we could edit them alongside the first dance footage. We sincerely loved every minute we spent with the happy couple and their amazing friends and family. Thank you so much Dianna and Felix, you were both so kind and considerate, and we wish you an amazing future together. Fetcham Park in Surrey is a stunning and unique venue, with beautiful grounds, gorgeous decor and, as you can see in Cindy and Jacky’s wedding film, a spectacular fountain :) The staff at Fetcham Park are so helpful and hospitable, led by director Laura, who makes sure everything on the day is perfect (and always with a smile!). It’s no surprise that Fetcham Park has won the “best venue in London and the South-East” in the Wedding Industry Awards for two years running! The day started off with Cindy getting ready at Brooklands Hotel, which is a smart and modern luxury venue not too far from Fetcham. Cindy and Jacky are an awesome couple, with so much energy and enthusiasm, and it was such fun sharing their big day with them. Cindy and Jacky were smiling all day long, and even at the end of the night they were full of energy. We love Chinese weddings, especially the contrast between the crazy games the groomsmen have to endure and the quiet calm of the Tea Ceremony. There were many brilliant moments, but the highlight for us was filming the final shot, with the bride and groom, still full of beans, happy to have some fun in front of the main fountain. A very cool end to the night! Thank you so much Cindy and Jacky for being so great to work with. It’s clear you have an amazing future ahead of you, filled with love and happiness. The Belmond Hotel Caruso in Ravello, Italy, is one of the most spectacular wedding destinations in the world. The views of the Amalfi Coast are breathtaking and the hotel itself, built around an 11th century cliff-top palace, is simply stunning. This was the perfect setting for the perfect couple. Georgie and Eddie were a delight to be around, as well as being one of the most gorgeous couples you will ever see. The love they showed for each other and for their beautiful little girl hopefully comes across in the film. Walking hand in hand through the cobbled streets of Ravello, Georgie and Eddie looked like they’d just stepped off the pages of Italian Vogue. Georgie’s stunning wedding dress, by top designer Galia Lahav, turned heads all day, and let’s just say it’s lucky there aren’t many cars in Ravello, as the bride in this dress may have caused multiple traffic accidents. Add to this the perfect weather, stunning views, awesome guests, talented musicians, heart-melting speeches and buckets of love and it’s no surprise this film one of our absolute faves. Congratulations Georgie and Eddie, and thank you so much for flying us out to record your fabulous day. Wishing you a lifetime of love and happiness! what a fantastic clip of Georgie and Eddies wedding, you get a small taste of what it was like, but to be there was absolutely amazing, the memories will stay with me forever. I treasure and love all my family from the bottom of my heart. And so very very proud of them all.